Diva Essenza Mei Tai can be used from birth due to adjustable base and wide straps, so that you can insure correct legs position and good back support for a baby. 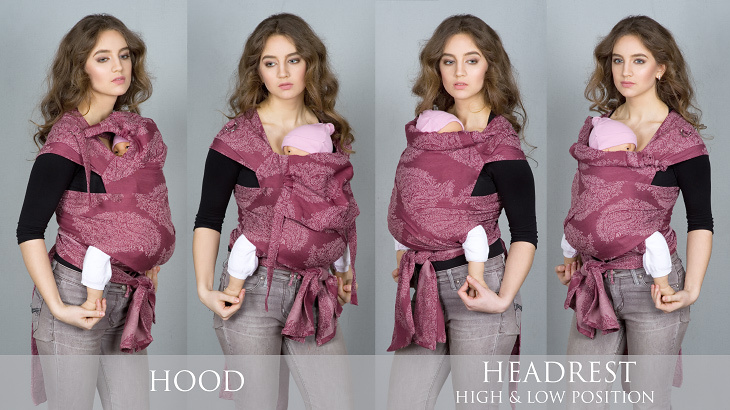 ATTENTION: in 2015 we changed the hood construction, now all mei tais have hoods which can be fixed with 2 half-rings on each shoulder strap. You can use a hood as a headrest with 2 possible positions. All our photography and instructions will be changed gradually with time. All mei tais shipped from our web shop have a new hood construction.